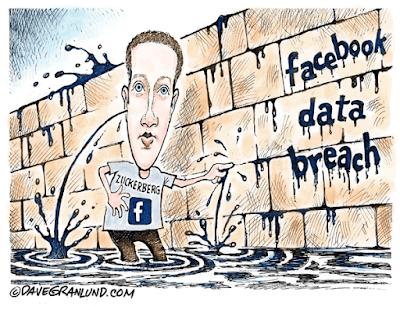 The breach of user data by Facebook appears a mere pass out news but if you think about it you can shock yourselves with revelations. You spend your time on Facebook posting things related to you and your lifestyle, your thinking, your ideology and sometimes it also denotes your financial status and position in society. Reactions on your post can be judged as people influenced by you and now think if these things are used by strategists/ analysis firms to create a strategy to manipulate or influence you without your knowledge. Is this shocking? If not than think about the apps you connect through Facebook, in some of them you have used your bank details, personal identity details and now think if they can be used to create your parallel identity or did a bank fraud with you. Is it shocks now? Some will be judged it as a science fiction movie plot but that is actually happened according to a London based data mining and analysis firm Cambridge Analytica. They stated that they helped influenced 2014 Indian general elections by utilizing data of many Indians. Ravi Shankar Prasad confirmed it in the Parliament house and said that they can summon Mark Zukerberg to India if that news of data breach by Facebook appears to be true but we can laugh it out because Government of India if can summon people of other countries than they must summon those absconding Indians who are taking refuge there after doing big billion frauds. About 6 million user's data was breached or compromised through Facebook and the founder Mark Zukerberg has apologized for the same but the process can't be undone. So think twice before posting anything on social media and link only those apps with social sites which are necessary. Delink/Logout from the apps which you think are useless. Use appropriate security in mobile wallets and bank apps and avoid opening any irrelevant message or link in mails. Like Right to life, right to privacy is also a basic human right which must be protected by every government and for which every citizen must stand to fight. What are you if you lose your identity? What if someone stole yourself from you? These things in Indian context appears somewhat sci-fi but when we are getting subsidies in our name the scams related to it can become reality. People doing crimes by posing as you can be a truth in such scenario. We have heard about dead people giving vote. Isn’t it possible that somebody is also enjoying benefits in the name of dead people? The data thing is too complicated but just remembers to share minimum of you online and connect more with people offline. It doesn’t imply that you avoid technology but use it wisely. Consult others on things you don’t know in cyber world. Till next post Live and Let Live.